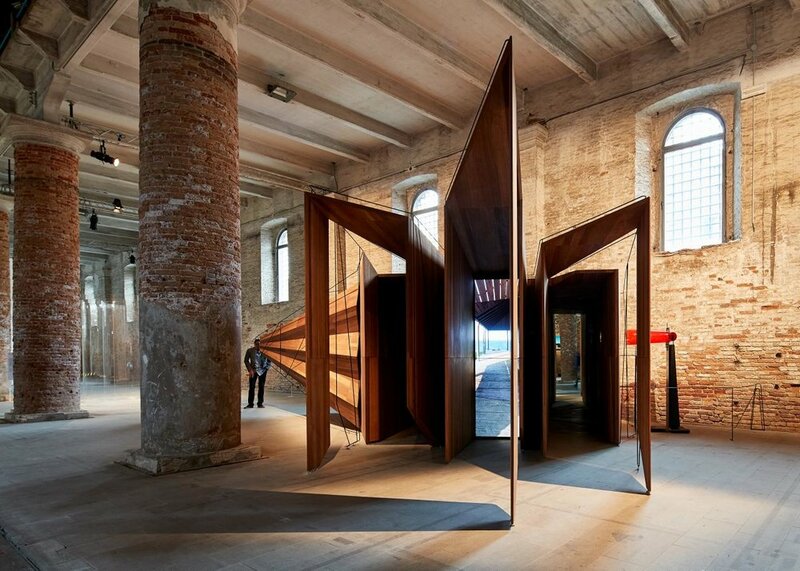 Visitors are invited to peek through five portals within timber and steel structure ‘Somewhere Other’, a compact, interactive experience by Melbourne practice John Wardle Architects. 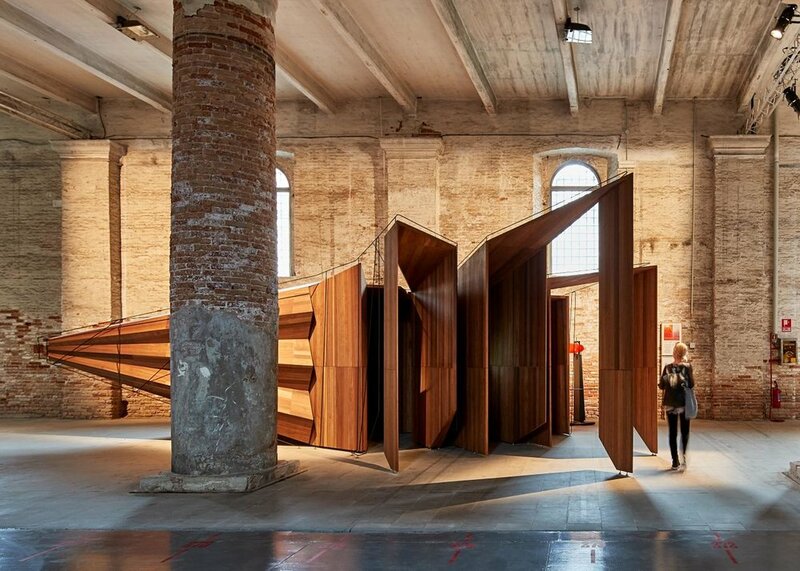 At NGV Australia until late July, this intriguing installation was first shown as part of 2018’s 16th International Architecture Exhibition at the Venice Architecture Biennale (pictured, top and above). Each of the wooden volumes, voids and apertures in its interconnected series frames views of the studio’s projects, the Australian landscape or the craft of collaborators including artist Natasha Johns-Messenger and filmmakers Coco and Maximilian. We’re big fans of Artedomus’s ‘New Volumes’ collection, which showcases solid marble homewares by eight Australian designers. This Collingwood exhibition, curated by interior designer Fiona Lynch and designer Thomas Coward, represents the range in an installation that follows the journey of this sculptural material from the ‘ground to the house’, contrasted with a series of chunky marble plinths. Presented by Fitzroy interiors store Modern Times, group exhibition ‘Material Thought’ explores material through the work of innovative Australian designers. On show are furniture, lighting and objects by nine top talents, including Henry Wilson (‘Stone Surface Sconce’, in Calacatta Marble, above), Coco Flip and Christopher Boots, all illuminating themes of design experimentation and sustainability. Fans of modernism will enjoy exhibition ‘Clement Meadmore: The art of mid-century design’, a homage to the acclaimed Australian talent. The first major survey of Meadmore’s industrial design practice, it explores the inspirations that shaped the renowned sculptor’s early career as a designer. Part of a new wave of Australian design in the Fifties and Sixties, Meadmore championed streamlined forms, fresh materials and new manufacturing processes. His furniture and lighting appeared in the houses of iconic architect Robin Boyd, with well known designs such as his 1951 corded dining chair on view at the Ian Potter Museum of Art. Presented by Friends & Associates, ‘Welcome to Wasteland’ shares the work of cutting-edge local talents involved with sustainable design. Featuring architects, industrial designers, furniture makers and researchers, the show explores the potential of waste materials recycled into fresh, eco-friendly products. Typically innovative is Vert Design’s ‘HuskeeCup’ made from coffee husk waste, their collaboration with Spark & Burnish to craft ‘Marine Debris Bakelite Door Knobs’, and Maddison Ryder’s use of discarded Iceberg lettuce to form ‘Lettuce Eat’ disposable plates. Other materials in the mix include waste glass, ceramic, plastic, oyster shells, rubber bands, paper pulp, denim jeans, pigs’ blood and even golf balls! A curatorial showcase of experimental design, fine art and objects, interior designer Fiona Lynch’s new permanent gallery Work Shop aims to celebrate work by Australian and international designers and artists, as well as doubling as a testing ground for her own studio’s practice. For Melbourne Design Week, the debut show curates a selection of pieces examining the tension between resolved and incomplete elements, including ceramics by Olivia Walker (black porcelain collapsed vessel, above), burnt wood bowls by Makiko Ryujin, paintings by Jiaxin Nong and lighting design by Mary Wallis.